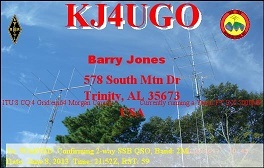 Posted by Gary WA2JQZ with Rob KB5EZ. 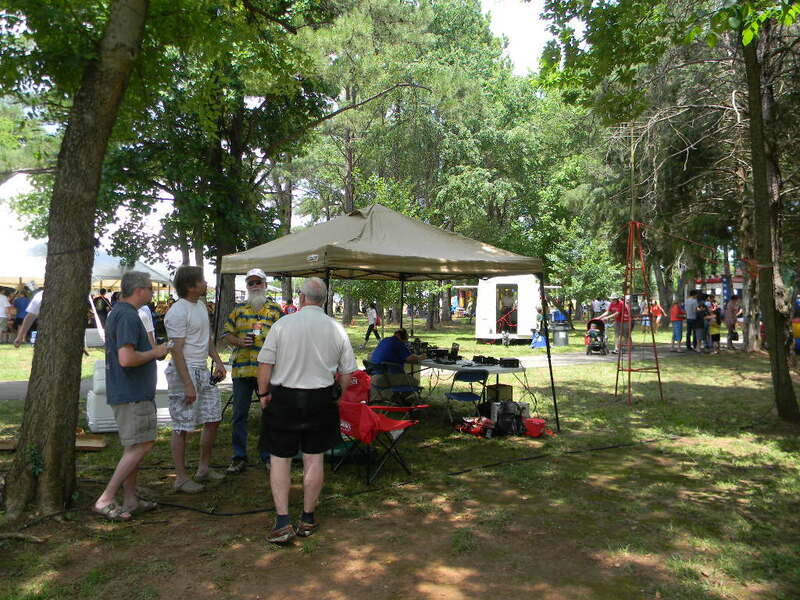 Marshall Amateur Radio Club tent set up in the NASA Family Picnic area. We had the portable mast with a rotatable VHF antenna. 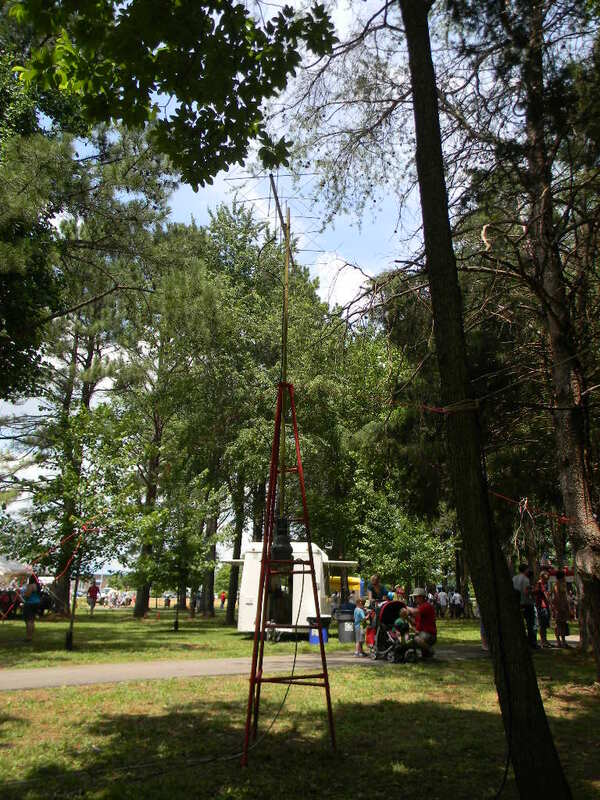 Rob’s G5RV Jr wire antenna was strung to the trees. 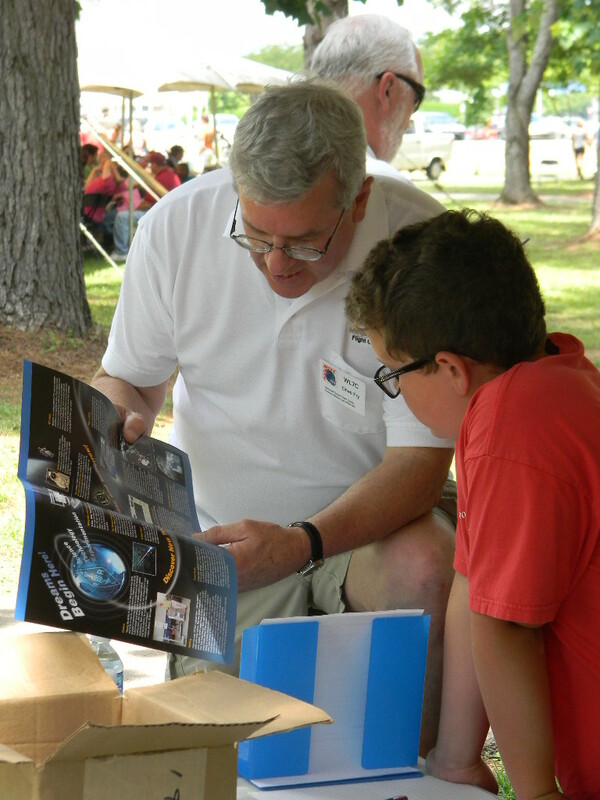 On a sunny Saturday June 8, 2013, the Marshall Amateur Radio Club took part in the annual NASA Family Picnic at MSFC. 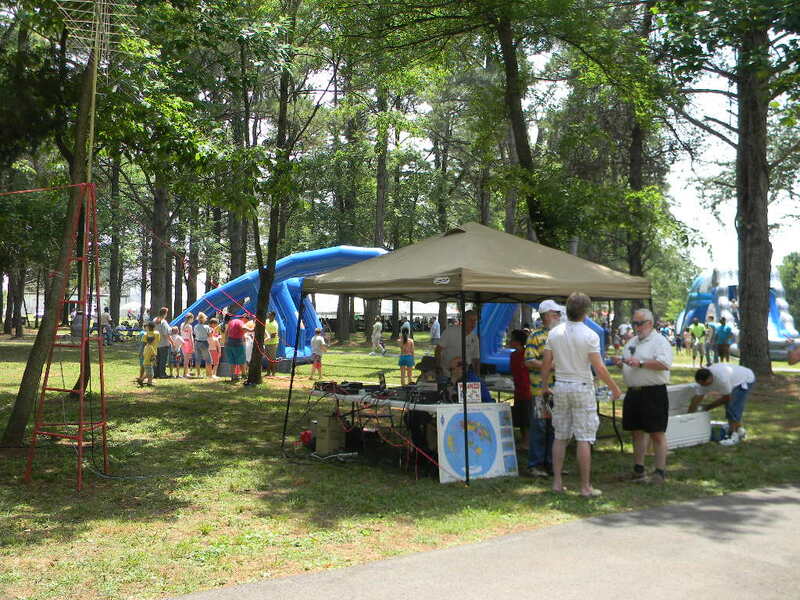 We set up under a tent, surrounded by child-friendly activities and other clubs. But also the band stage was located not far away. We had access to power. And, a water cooler was conveniently located right next to us. 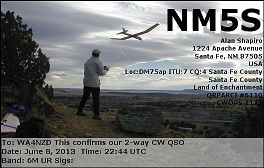 Don N4MSN set up a portable antenna mast close by, from which we deployed a VHF antenna. 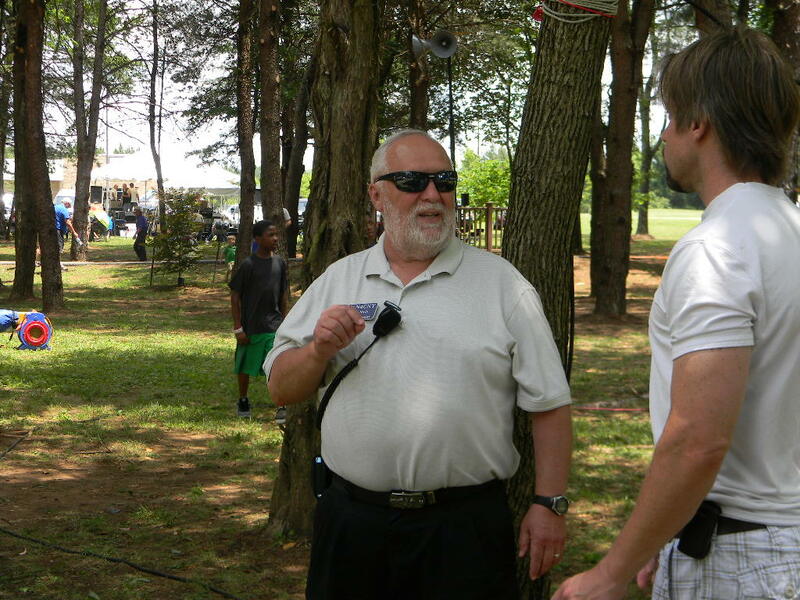 Rob KB5EZ set up a G5RV jr wire antenna in the trees for HF. We operated with the Yaesu FT-950 for HF and 6 meters, and the FT-897 for VHF/UHF. The weather for the day was beautiful. Many people of all ages stopped by to visit us. 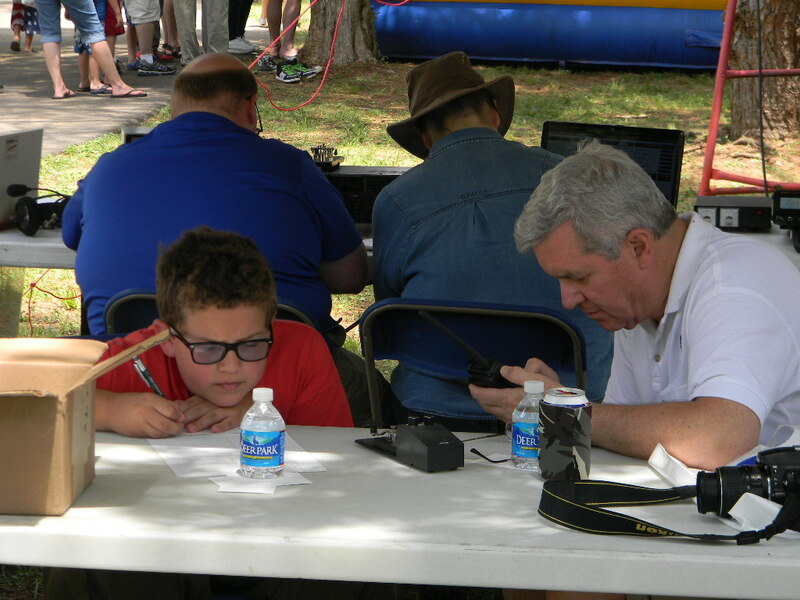 Members of the club took turns talking with folks and operating the radios, and enjoying the day. The center director and his wife dropped by the tent at the beginning of the event. 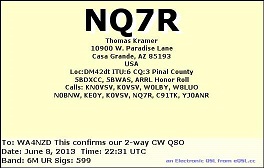 We made a lot of folks aware of the club as well as ham radio in general. 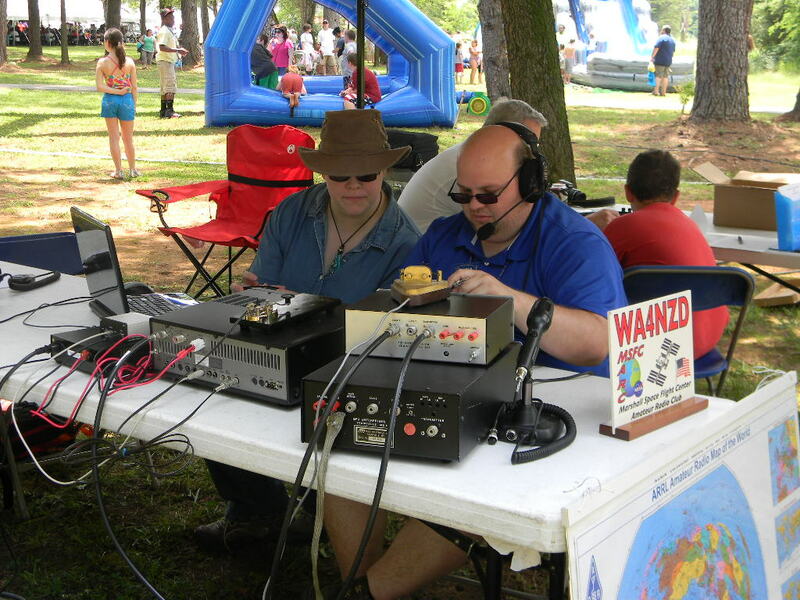 Alan WB5RMG and John N4CNY discussed ham radio by the Marshall Amateur Radio Club tent. 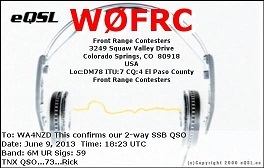 We made a few HF contacts, mostly digital modes due to the QRM (loud sounds) from the band on the nearby stage. 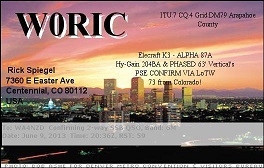 Yet that weekend also was the ARRL June VHF Contest, and we succeeded in making a few local phone contacts on 2 meters as well. Matt KA0S and Rob KB5EZ. Several young boys and girls, with their families, spent time with us. Some were delighted to have us teach them Morse Code and help them practice. According to their interests and curiosity, we showed educational brochures, engaged them with some deeper understanding and fun, and talked about next steps they could try. Studying Morse Code sheet while Ghee WL7C took a radio break. Matt KA0S and Jenny M. operating. After the picnic concluded some members returned our equipment to the shack, and continued to operate for the ARRL VHF Contest into the evening. 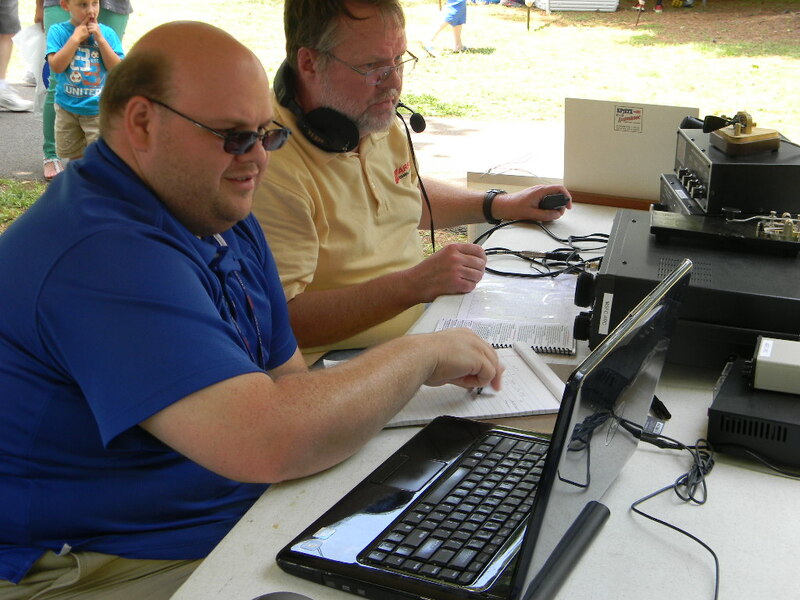 Some members returned to the shack on Sunday too, and again continued to operate for the VHF Contest. 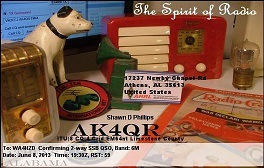 During the picnic, propagation at 50 MHz and above was poor. 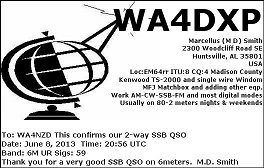 But back at the shack, 6 meters sometimes opened to the U.S. southwest. And then we had 6 meters “magic”. 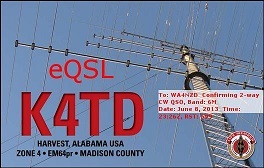 Below are some of the eQSLs we received from our VHF Contest contacts. 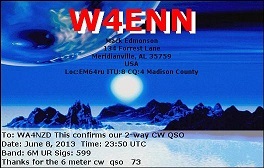 Some QSLs are from north Alabama where we are located. And some come from the openings to Colorado, New Mexico, and Arizona. 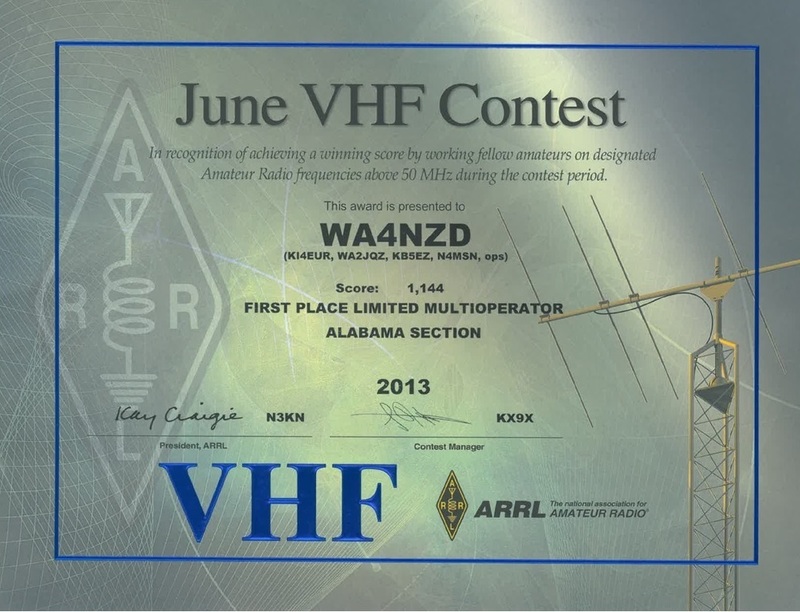 We had been awarded First Place within the Limited Multi-Operator category, for the Alabama Section, for the June 2013 VHF Contest! Probably not many other folks in Alabama operated in this category. But nonetheless, that was sweet!